"Native-born" Hass avocados have become the most popular variety in California, but Sacramento News and Review writer Alistair Bland said the state's farmers may be unnecessarily limiting their horizons. Avocados originated in south-central Mexico and archaeologists in Peru have found domesticated avocado seeds buried with Incan mummies dating back to 750 B.C., according to the California Avocado Commission. 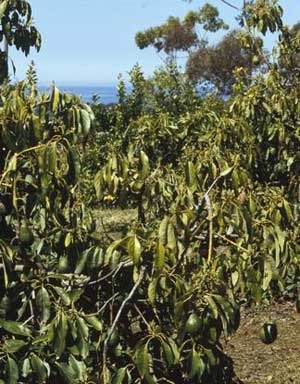 The mother tree of all Hass avocados was born in a La Habra Heights, Calif., backyard. Bland laments the homogenization of the California industry around the Hass variety. He spoke to farmer Randy Shoup of West Pak Avocado farm in Temecula, who said he doesn't look twice at any non-Hass variety. 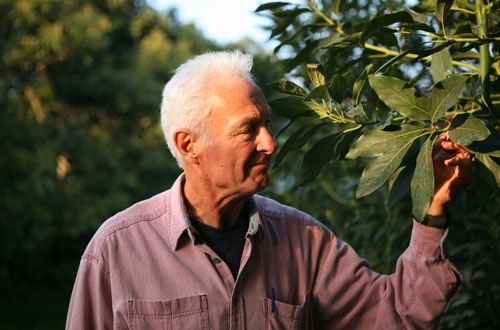 "Though his website product list still describes several oddball avocados, he says he’s eliminated nearly all non-Hass trees from his property," Bland wrote. A Hawaii avocado farmer who has collaborated with UC Davis and USDA in experimental cultivation on his Big Island farm told Bland that California avocado growers "need to get out more."  "He once ran a blind taste test of estate and imported avocados on local chefs. Winning varieties included the rich and buttery Kahalu’u and the islands’ favorite, Sharwil. Californian Hass flunked," the story says. The Hawaii farmer once told Bland he won’t even let his horses eat Hass, "which perhaps leaves more for us." The avocado seed moth, Stenoma catenifer, could wreak havoc on California's avocados should the pest make its way to the state, according to UC Riverside entomologist Mark Hoddle. Hoddle is in Peru until July to study pests of avocados in the South American country, according to a UC Riverside press release written by Iqbal Pittalwala. The avocado seed moth is native to Peru, and is particularly destructive in avocado-growing areas in the Chanchamayo region of the Junin District – a warm, humid jungle zone, the release said. 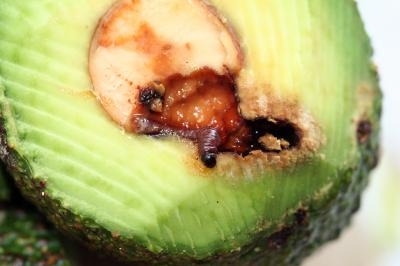 "As part of the Stenoma survey, we are prospecting also for unknown species of avocado fruit pests – those that have not been recorded attacking avocados before," Hoddle was quoted. "These would be the wild cards in invasion biology because we don't know what they are and we don't know how to look for them, or what their tell-tale damage signatures are. This type of information collected in collaboration with overseas trade partners will help us to more confidently identify risky invasive pests." Hoddle said he and other scientists want to be fully prepared should this pest become established in California and threaten the state's $320 million avocado crop. "We want to get ahead of the curve by proactively identifying any new pests, should they exist, and documenting in detail what damage they cause," he was quoted. "We also want to identify any natural enemies they may have and how effective these biocontrol agents are." An avocado ruined by avocado seed moth. The creamy, healthy complement to spicy, crunchy nachos - avocados - may be in short supply this spring, according to a Los Angeles Times story that has been picked up all over the nation. California farmers expect to harvest the smallest avocado crop since 1990 and possibly even as far back as 1980, the story said, and prices will creep higher. "Holy guacamole," joked LA Times reporter Jerry Hirsch in promoting the story on his Twitter account. For the article, Hirsch spoke to UC Cooperative Extension farm advisor Ben Faber to get his take on California's looming avocado deficit. He assured Hirsch that, even in the absence of California avocados, growers in other parts of the world with keep Americans in guacamole. "Mexico is so huge that if they see good prices here, they will divert fruit up here to capture those higher prices. And that drives up prices in Mexico too, so it is very clever," Faber was quoted in the story.